[ARCHIVED THREAD] - M16A1 almost finished last night, but flash hider is too big on threads? I got my barrel from John Thomas last night, and MAN does he do good work! I got it screwed on and everything went together fine except the flash hider. My flash hider seems much bigger than that, it just doesn't even try to engage the threads. The only stampings on it are "MADE IN USA" and "02/09". I got it with the M16A1 parts kit from Royal Tiger Imports. Do i have the wrong flash hider? I'm assuming the barrel is correct. If I do where do I go to find a correct flash hider? The rest of the gun is colt so I'd really prefer to use an origianl Colt A1 flash hider. Do i just watch the EE? Pics of flash hider below. It doesn't have the flat area on the bottom for the wrench and instead has three dimpled holes at the bottom. Yea sounds like a 308 FH. Surprised it showed up in a kit though. Thoughts on what to do with it? I'm guessing it's not terribly rare. 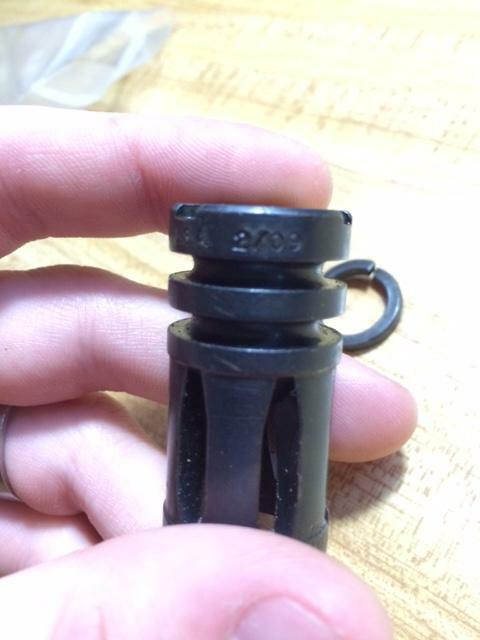 I did some research and it seems tricky to find an original A1 flash hider. Any leads on where to find them? I would keep checking the EE. I bought a few things from a guy selling various colt 6920 and SP1 parts and the A1 birdcage he had listed sold for $20 just a few days ago. So I'm thinking to just throw the 7.62 flash hider on the EE. Should i just ask for 20 bucks or is that too much? And is it for sure a Colt flash hider? I did a bit of research and don't see anything like it on the internet. Edit: posted a link to gunnyssurplus but their shipping charges are $17 for an $11 part. Checked that site out and i'd probably go for that however there's no washer and the only place selling a Colt washer wants 25 bucks just for the washer! That is a flash hider for AKs. 14mm. Yup that's it right there. That's a bummer that Royal Tiger included that as my flash hider in my parts kit. Yep the detent notches give it away. The good news is that you'll make more selling that AK-thread birdcage on the EE than buying the new birdcage for your A1 build will cost. 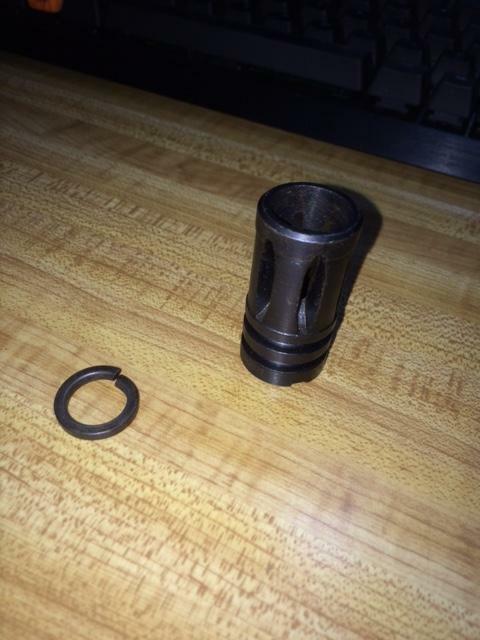 Got an A1 flash hider from a user here for less than $20 shipped! Thanks again for all the info!